Here is the latest news and updates about the RNGB. Many thanks to John for a very enjoyable day with bells in Oxfordshire and it was great to see so many people attending. An outing report has being written and is in the Outings page. Congratulations to Bill H on winning the cartoon caption competition, which is on the cartoon competition page, along with the 'best of the rest'. A report on the Quarter Peal Day in February to mark the fourtieth anniversary of the first peal rung by the guild can be found on the Peals page and also on Bellboard. Details of the Army Guild outing on 06 April 2019 are shown on the Meetings page. This year it took place in November to commemorate the Centenary of the Armistice and a pleasant and successful day in West Sussex was had by those attending. A report and details can be found on the Peals page and also on Bellboard. Another excellent and well attended outing enjoyed by all, concluding with a superb dinner and an outing report written by Chris, Martyn and Graham is on the Outings page. Many thanks to Bill and Graham for organising and arranging the good weather! Details of the Quarter Peal rung in memory of Barry, who was a past president of the Guild, can be found on the Peals page and also on Bellboard. Prior information about this year's Trafalgar Weekend in the Portsmouth area have been sent out informing about the proposed celebration of the Guild's 40th Anniversary, accommodation and ringing. Due to the Great South Run also taking place in the area, it is advised members book accommodation now to ensure they have a room. Details of the outing on 19th and 20th October 2018 are shown on the Meetings page. Unfortunately, due to the weather conditions, this year's RNGB AGM outing did not take plave. Efforts are being madre to rearrange or come up with an alternative and details will be published when confirmed. Details of the Army Guild outing on 07 April 2018 are shown on the Meetings page. As usual, there is a cartoon caption competition, which will be judged at the AGM. This year's cartoon is on the cartoon competition page and the winning caption and best of the rest will appear following the AGM. Details of the RAF Guild outing on 10 March 2018 are also shown on the Meetings page. Another great and well attended outing, which was enjoyed by all and an outing report written by Helen is on the Outings page. Many thanks to Joan for organising and also to Rose for feeding us on Friday! RNGB members joined some of the local band to ring at this prestigeous event and an outing report written by Anna G is here. A copy has also been sent to the Ringing World. Further information on the event itself can be seen on the RN webpage. A very successful day was had by those attending the Quarter Peal Day on Saturday 22 April 2017 to celebrate the Queen's Birthday and details can be found on the Peals page and also on Bellboard. Many thanks to Mike for a very enjoyable day with bells in the Northampton and surrounding area. An outing report has being written and is in the Outings page. The winning cartoon caption and the best of the rest are on the cartoon competition page. A very successful day was had by those attending the Quarter Peal Day on Saturday 4th February 2017 and a report and details can be found on the Peals page and also on Bellboard. It is with sadness that we have heard of the death of Steve Lowman of Lambourne on 30th Novemebr 2016. He had not been well lately and there was a garage fire which he tried to stop spreading and suffered a massive heart attack. 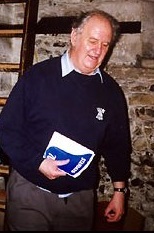 He did an enormous amount to improve the ringing at Lambourn and will be sadly missed in the tower and locally in ringing circles. Our thoughts are with his wife Pat. 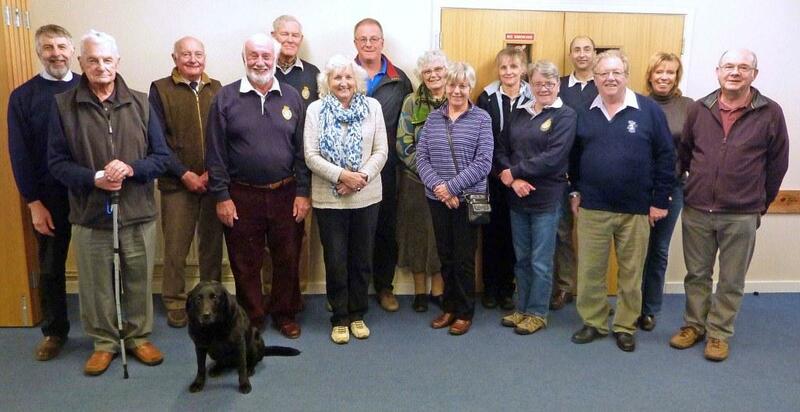 A great time was had by all who attended and an outing report written by John P is on the Outings page and an edited version has been sent to the Ringing World. Although the Peal was unsuccessful, a Quarter Peal was rung and dedicated to Dennis Martin. Details are on the Peals page, in the report and also on Bellboard. It is with great sadness that a long serving and active member of the Guild, Dennis Martin, passed away on Sunday 11th September 2016. Although he had been unable to attend recent outings due to illness, previously he and Barbara had always attended the various outings during the years, as well as hosting a few themselves and he will of course be remembered for taking members on a tour of Salisbury Cathedral and his culinary delights, especially cakes as well as his bright ties! A Quarter Peal by Guild members will be rung during the Trafalgar weekend, but a Quarter was rung for him at St Faith’s, Havant where he occasionally rang, along with attending the famous annual Havant Bellringers Christmas Meal. For all those who met and knew Abby, it is with great sadness that after a short illness, she has reluctantly departed this earth. Her interests were many, ranging from historical sites, food, swimming, walking, sunbathing, pubs and bellringing. Although she never actually learnt to ring, it did play a major part in her life by attending many tours and outings and with living next to Hugglescote Church she would always be out in the garden listening to visiting bands, peals and quarter peals, as well as any general ringing. She also oversaw the winding of the clock and the raising of the bells for weddings on many occasions. However, it was the ringing outings she loved, especially the Royal Naval Guild (she was the RNGB unofficial mascot) and the Oxenhope tours. Earlier this year she attended the Oxenhope outing in East Yorkshire and even up to the end was assisting in arranging this year’s Royal Naval Guild Trafalgar outing, with the accommodation, food venues and proposed towers being closely inspected by her for approval. While attending outings she did not actively take part but would watch people disappear up to the ringing chamber and patiently waited for their return, listening to the ringing in between. On some outings coach drivers would look after and walk her and even tower contacts were coerced into taking her for a walk! At the RNGB AGM teas she was always a great help in clearing up, especially under the tables! Her holidays also involved bells and only two weeks ago, in a period where it looked as though she had recovered, she was at her favourite holiday destination Scarborough, playing on the beach, swimming in the sea, eating ice creams and listening to the bells on practice night. 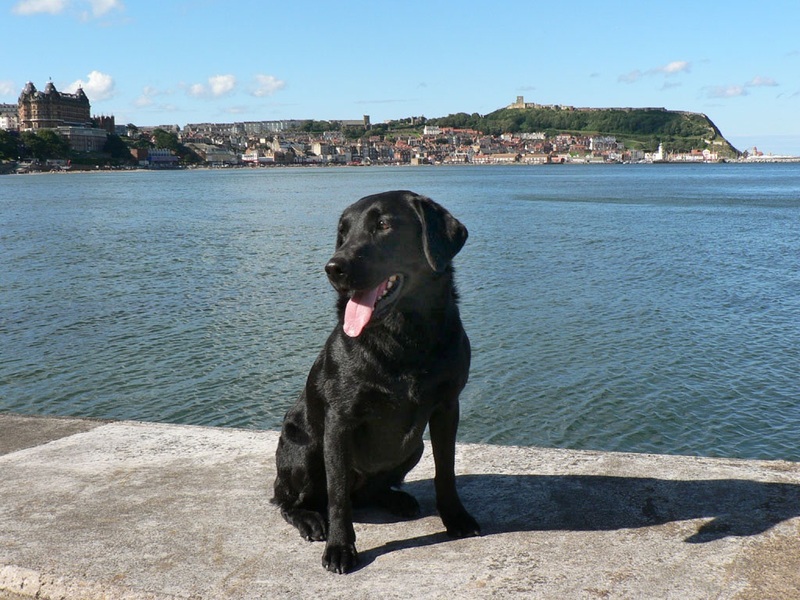 A few years ago she had attended and thoroughly enjoyed a Scarborough tower tour in South Yorkshire, visiting new places. Abby is now running and swimming free in green fields with a river flowing through, next to the sea with a sandy beach and ice cream stalls and a church with bells close by. Bliss! A Quarter Peal of Plain Bob Doubles, including three RNGB members, was rung at St John the Baptist, Whitwick on Monday 15th August 2016 in celebration of her life and her obituary appeared in the Ringing World. Details of the successful Quarter Peals at Bishops Cannings and Calne are listed on the Peals page, including some information about relatives of the band who were at Jutland during the battle. Details have be published and are shown on the Meetings page. Many thanks to John for a very enjoyable day with some lovely bells in the Redhill and Nutfield area. The outing report is on the Outings page and an edited version has been published in the Ringing World. Many thanks to Joe and John for organising a very enjoyable and well attended weekend in the Swindon area. The report is now on the Outings page. Many thanks to Tim and Diana for orgainising not only an excellent outing but some great weather! The report is now on the Outings page. Also congratulations to Bob for the winning caption for this year's cartoon competition and receiving a year's free subscription to the Guild! 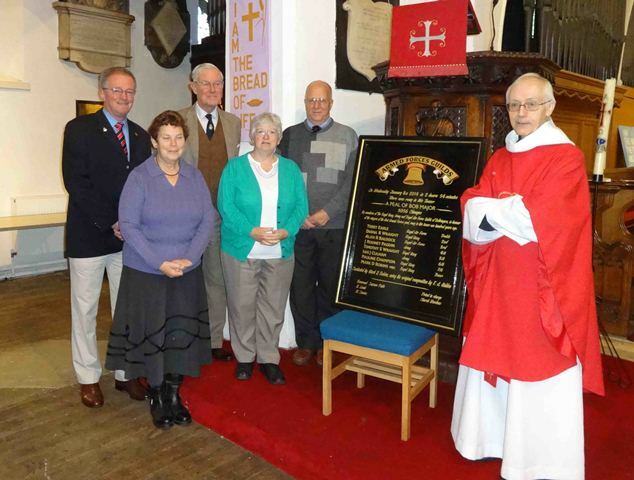 Following the Centenary Peal by an Armed Forces Band back in January 2014, a peal board was unveiledand presented to the congregation at St Mary, Gillingham on Sunday 23rd November 2014. A small ceremony was laid on with a short explanation by Mark our Ringing Master of the background and history of this event and the priest gave a very appropriate blessing in the context of the First World War Centenary. The Guilds were represented by John Verity, Christine Baldock,JohnDavey, Maggie Vince and Mark Robins, who were welcomed by the church and ringers and expressed their gratitude for the performance and the board itself. The church intends mounting the peal board alongside the original board in the belfry once the appropriate faculty has been granted. Another successful and very enjoyable weekend was held in the New Forest area and our thanks go to Deborah for arranging it and the report is now on the Outings page. Next is the AGM in the New Year. Photos will be added as and when they come in. If anyone wishes to see any of their pictures of RNGB events go on the site, please email them through to the sec@rngb.org.uk If anyone is not happy with a picture showing themselves, please let the Secretary know. The Birth of a Bell DVD - a DVD has been produced showing the story of the Treble Bell, donated in 1993 by the RNGB, for the Fleet Air Arm Memorial Church at Yeovilton. It follows the bell being cast, tuned, installed and rung for the first time as well as including the dedication service for the Church. It is approximately 1.5 hours long and was filmed by Barbara and Dennis, who have very generously donated the film to the guild and the price for a copy is £5.00, with £2.50 going to the Guild. If you would like to purchase a copy, please contact the RNGB Secretary.